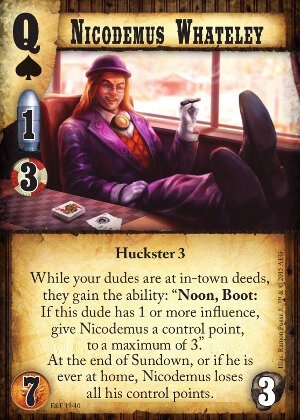 While your dudes are at in-town deeds, they gain the ability: "Noon, Boot: If this dude has 1 or more influence, give Nicodemus a control point." At the end of Sundown, or if he is ever at home, Nicodemus loses all his control points. Nicodemus is a tricky card - in the right situation or against opponents who aren't paying attention, he offers a chance to suddenly gain several control points which can give you a sudden win. Starting him plus a couple of dudes with influence can easily put you in a position to pull this kind of move on day 1 or 2. This works best in a control deck running Paralysis Mark and Phantasm - stay safe while you pin down their dudes so they can't call you out, then go for the quick win. Its very risky, however - if you start him, all your initial income goes just to paying his upkeep. While he's one of the strongest Hucksters in the game, he isn't that great a shooter. Kidnappin' or other early aggression can really ruin your day. Likewise, a California Tax Office on will force you to spend the rest of the game playing around that deed. Nick is a game winner, but only in the right deck and there is plenty of possibility for things to go wrong.